Photo: National Weather Service in Buffalo, N.Y.
Lake-effect snow happens when cold dry air that moves south over Canada meets the warm waters of the Great Lakes, Andresen said. The cold air picks up moisture as the warm water evaporates from the lake, forms into clouds and then dumps snow onto nearby cities and towns, Andresen said. The greater the difference in temperature between the warm water and cold air, the more snow will fall. That means the warm summer is only part of the recipe for lots of lake-effect snow. Already largely due to the ongoing loss of ice cover on the Great Lakes, the lakes have held increasingly warmer temperatures going into fall, said Brent Lofgren, a research scientist and climatologist at the Great Lakes Environmental Research Laboratory. But that hasn’t necessarily led to more lake-effect snow. “You need some type of large-scale weather system that would enhance it to cause more widespread precipitation,” Andresen said. This was seen last winter when, despite the warm lake temperatures persisting through fall, it was a poor year for lake-effect snow. We didn’t have many cold weather systems, Andresen said. Similarly, 2008, 2009 and 2010 were all big years for lake-effect because we had a relatively large number of cold air masses come through, he said. Contributing factors include wind speed and direction, friction created by wind moving from over smooth waters to landmasses and topography, Andresen said. Still, “when we do have the warm lake water, more often than not it does lead to enhanced snowfall,” he said. Photo: National Oceanic and Atmospheric Administration. 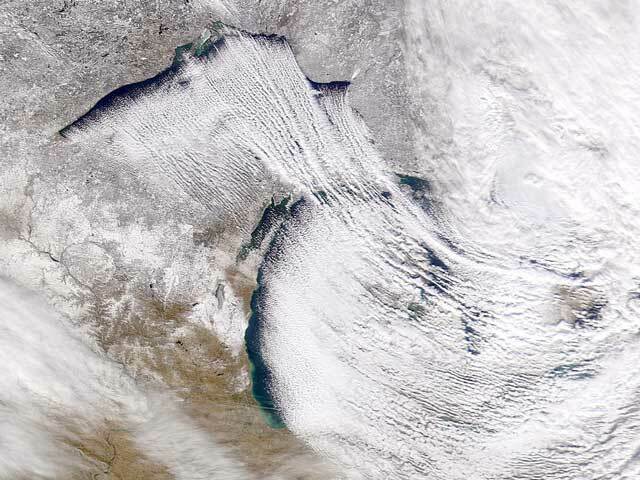 Lake-effect snow is more common to the Great Lakes region because of the lakes’ greater size and depth. “The lakes here are larger in area than most other lakes, so as air passes over them it has more time to accumulate a larger amount of water vapor,” Lofgren said. And their depth helps store the heat longer. Because the winds generally go from west to east, areas that are just east of the lakes get the most lake-effect snow, Lofgren said. Buffalo, N.Y., Cleveland and the Keweenaw Peninsula in Michigan’s Upper Peninsula receive some of the most lake-effect snow. The greatest frequency of snowfalls of 8 inches or more occurs in the Upper Peninsula, Andresen said. But to know for sure, we’ll have to wait and see. 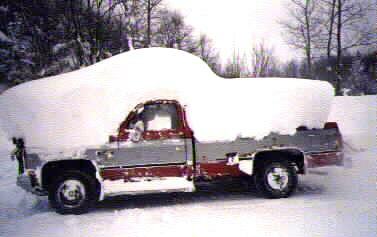 Lake-effect snow usually occurs in late fall to early winter, before the lakes cool significantly, Andresen said. The further we get into winter, the more heat is lost in the lakes and the chances for lake-effect diminishes. In other words, there’s a time limit. I WAS BORN AND RAISED IN GRAND HAVE. I MOVED TO ARKANSAS IN 1973. THEY DO NOT GET A LOT OF SNOW HERE. I MISS LOOKING AT IT, ON A SUNNY DAY. EVEN SLEDDING ON IT, JUST HAVING FUN. I REMEMBER THE SHOVELING, OR GETTING STUCK. SOME TIMES IT IS A PAIN, BUT PEOPLE FORGET THE BEAUTY OF IT TO. I HAVE A LOT OF MEMORIES OF SNOW.